For my friend's birthday dinner, she said she was in the mood for some pig. Incanto immediately came to mind. Perfect timing because I had just finished a race and felt it was reasonable to indulge myself for an evening. 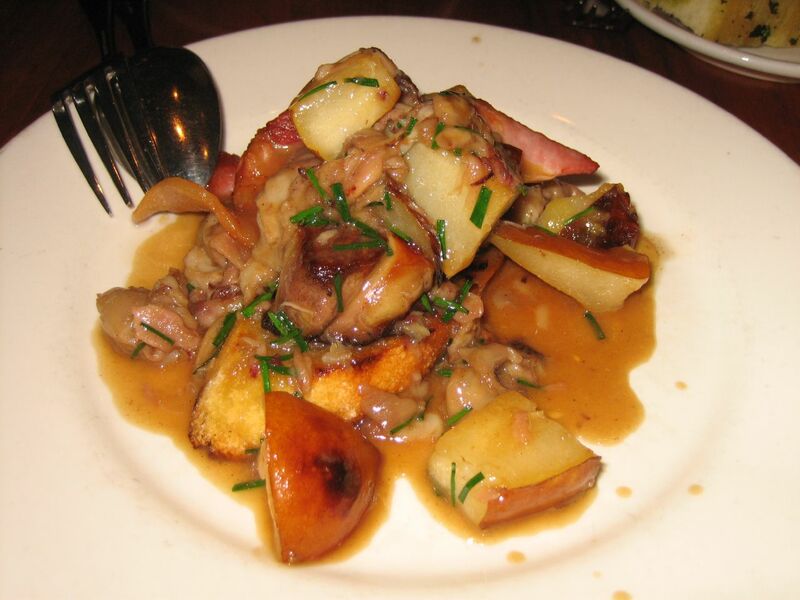 We started with a Pork Trotter served on a piece of bruschetta with a layer of foie gras then a cover of bacon accompanied by poached pears and topped with a savory pork sauce. A ridiculously porky dish and absolutely delicious. 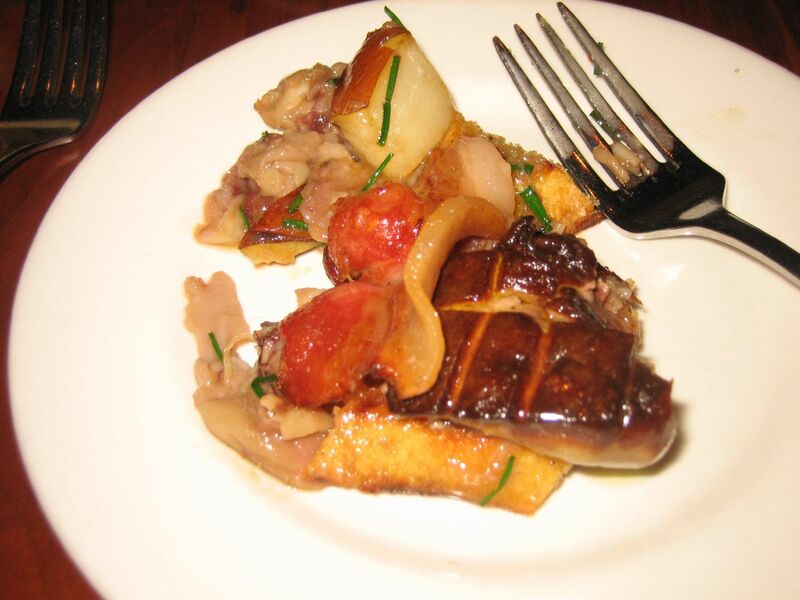 The creamy texture of the trotter went well with the slightly caramelized foie gras and salty bacon. The sauce was savory, but not heavy. The pears made a perfect sweet slightly tart counterpoint to the rest of the dish. Definitely something to order again. 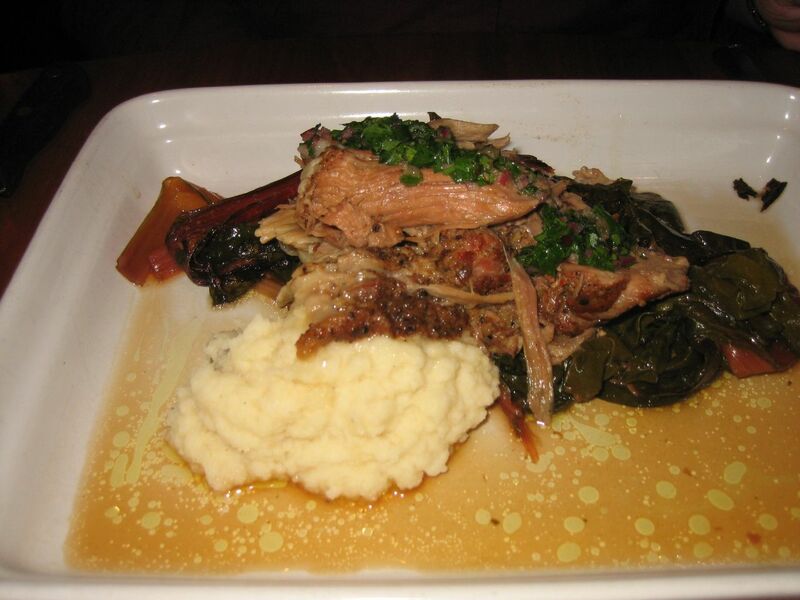 The following dish was the Braised Pork. A huge piece of pork braised so that it was tender and falling apart with a subtle five spice flavored juice. I liked that there was a decent amount of fat within the piece giving it a soft texture. It came on a bed of ramps which had a slight pickle flavor and some mashed potatoes. Perhaps the starter had put us over the top, as my overall impression of the braised pork was that it was good one which I would gladly order again, though not on the top of my list. 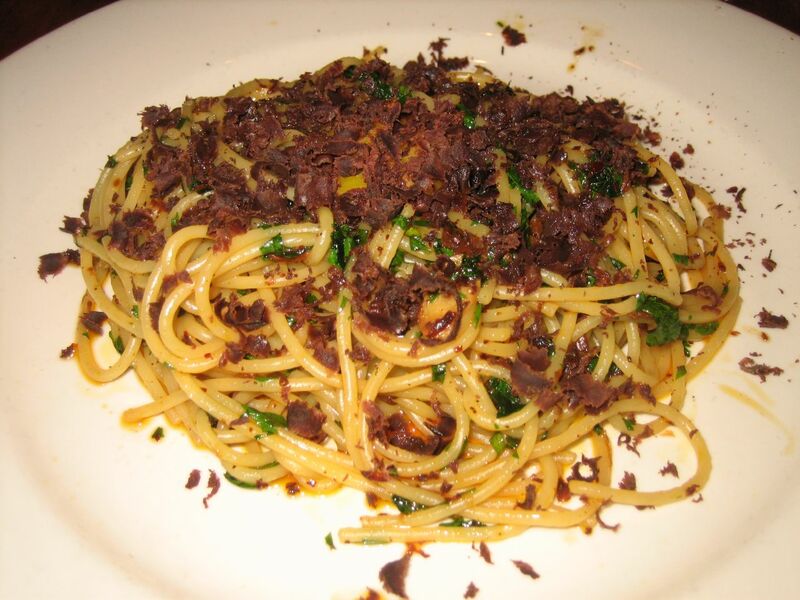 Our other entree was the spaghettini, cured tuna heart and egg yolk. The portion was very large and the amount of tuna heart looked like it was too much. It was not, the salty sea flavor of the tuna heart perfectly seasoned the pasta and the egg yolk added body and texture to the dish. The tuna heart had a smokier flavor than the one at La Ciccia, which was also very good. The La Ciccia tuna heart pasta was lighter in flavor and texture, -- more like a primi piatti than a secondi. Incanto's chef did not shy away from the tuna heart at all, I thought the smokey sea flavor and the egg made this very hearty and better than traditional carbonara made with bacon. Another must order dish. I was impressed with the relaxed atmosphere of the restaurant, upscale though not stuffy. The server was knowledgeable about the menu, gracious and unobtrusive. And having been a regular viewer of the NIC series, I was happy to see Chef Chris Cosentino in the kitchen on a weeknight dinner service. So we got the real thing. Thank goodness for San Francisco.